Managing security when migrating to the Cloud can be a challenge. The threat landscape is continually evolving; it’s no longer enough to just create a secure environment – sustaining your security posture is a full-time job. 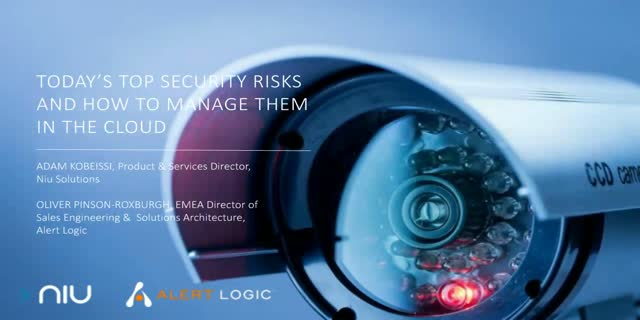 Join our webinar, in conjunction with our security partner Alert Logic, to learn about today’s top security breaches and how you can go about securing against them in the Cloud. We will explore how you can manage your security in the long run with a particular focus on pro-active monitoring and threat management. And will provide you with a valuable checklist to ensure you’re covering every angle when building your security and compliance strategy. The recent announcement by the FCA about upcoming regulation for the Crowdfunding market has left many Alternative Finance platforms wondering how they need to adapt? The market continues to grow rapidly, and technology innovation remains very much at the forefront of competition. Alternative Finance platforms need to revise their current strategies in order to comply with the proposed regulation, but also build flexible reliable systems and workflows that will enable them to continue innovating in the future, whilst maintaining their compliance. •What would companies need to do to overcome these challenges? •How can they continue to innovate and protect their business against new competitive entrants? •Is technology ready to deliver a “best-of-breed” approach? ·Open banking – Spurred on by regulators, banks will implement plans to open their APIs to third parties, leading some banks to become marketplaces. · Data analytics – Banks and fintechs will use wider access to transactional and other personal financial data to provide consumers with high quality insight and advice. ·AI – As artificial intelligence becomes more sophisticated, banks will make greater use of this technology, most obviously with chatbot applications. · New entrants – More digital-only banks will launch or expand their presence in 2017, but customer acquisition will be a challenge. ·Channel use – Branch closure programs will accelerate, while mobile will continue to grow in functionality and popularity, albeit at a slower rate than before. ·Regulation – Regulators will pay increasing attention to the fintech sector as its growing size increases its potential to affect the market, for good or for ill.
-How would you define/differentiate a challenger bank compared to an incumbent bank? - What are the most important challenger banks and are there certain markets where challenger banks are already more advanced? -What are revenue models of challenger banks? -How can Challenger Banks truly differentiate vs. traditional banks? -Can this differentiation be sustained in the long-term? -What will it take for Challenger Banks to become main-stream and how long will this take? The “regulatory sandbox” announced by the FCA has caused a lot of tongue wagging. Created with the desire to encourage innovative developments, it has also been critiqued for the potential risks involved as well. -What are the implications of the sandbox to Fintech companies and incumbent players? We know that the move to SaaS is a daunting prospect for Independent Software Vendors that have traditionally provided their software on-premise. But with continual pressure from end users to consume even their business critical applications via the Cloud, it’s something that should be on the agenda for all ISVs. During our webinar we will explore the perceived challenges of moving to a SaaS delivery platform and talk through what steps an ISV can take to overcome these. We will be joined by Bob Suter, ISV Business Development Leader at IBM, who will be able to share insight from his extensive experience in helping ISVs make the move to SaaS. Join our webinar to learn about what you need to consider when starting to build your roadmap to SaaS. In the age where customer experience is becoming a primary mode of competition and markets are being shaken up by digital disruptors such as Uber and AirBnB, traditional organisations are left wondering, how can we compete? Do they look to scrap their legacy systems and start again, or find a way to integrate these systems with new digital applications? Join our webinar, where we will discuss what today’s customers are looking for when they interact with a company, what does good customer experience look like and how can you differentiate? We will explore the key considerations when building your roadmap to digital business transformation; highlighting that this is a journey, not a destination. The lending industry has definitely been disrupted, with P2P lending leading the way. But with recent developments and incumbent organisations trying to play catch up, will Fintech be the main or alternative solution for the lending industry? -What are some of the benefits that banks still offer in this space? -What does the lending environment look like in 2016? -What are some of the things new fintech companies can do to become the main lending solution? There is nothing more likely to impact a customer’s confidence in a brand than the loss of their data. This is why PCI compliance is gaining priority on the security agenda for most organisations. Whilst PCI controls are there to protect card data rather than personal data, the standards it puts in place are being seen as the perfect guideline to keeping your customers safe. The standard is also gaining traction as the digital world becomes better connected. Merchants are integrating their platforms with other providers to add new competencies such as mobile payments, and these organisations are now looking for PCI compliance as a pre-requisite to integration in order to protect their own businesses. Join our webinar to understand more about the requirements of PCI and what it takes to be compliant. We explore the importance of not only making your organisation secure, but what it takes to ensure the sustainability of your security in response to constantly evolving forms of attack. This is particularly pertinent in the face of the General Data Protection Regulation (GDPR) agreed recently, meaning it’s more important than ever that organisations take control of their security responsibilities. In the wake of the FCA's paper on outsourcing to the cloud, released in November, the stigma around Cloud in Financial Services has finally started to lift. But many Financial Service organisations are still left wondering what this really means for them. One things for sure; a compliant Cloud certainly can’t be bought off the shelf. During our webinar we will discuss what considerations you need to take into account when building or moving a compliant environment into the Cloud. We will also touch on the unintended consequences of Cloud and how you can mitigate the risks. Join us to learn about how your organisation can start to realise the benefits Cloud has to offer, even within a regulated market. Tim Edwards, Solutions Consultant at Niu Solutions and Chomoi Picho-Owiny, Creative Director and Founder at Made Carefully. As the shape of the workforce is changing, we look at the importance of managing your applications and systems to ensure maximum end user productivity. During our webinar, we will explore how there is more to consider than just delivering your applications seamlessly and securely to your end users. There are many other factors to take into consideration too; such as user experience, user adoption and collaboration. Join our webinar to learn how often over-looked factors such as platform design can be the key to ensuring a better experience to your end users, and a more productive use of your business critical applications. Adam Kobeissi; Retail Business Development Director, Niu Solutions and Steve Strutt, Cloud Advisor, IBM. Planning for peak performance is the most critical challenge in a retail CIO’s annual calendar. Traffic is hard to forecast and even if you would prefer to smooth out your peak traffic by avoiding abrupt spikes such as Black Friday you are at the mercy of your competitors. Join us for our webinar, where we will explore the pros and cons of network provisioning in different cloud models, one size doesn’t fit all and you need to be confident you are selecting the right mix for your business. We work across the Financial Services and Retail sectors to consult and advise our clients on aligning their IT strategies with their business objectives to ensure success. At the heart of this is improving their customer experience with technology. This channel will explore how technology can be used as an enabler, and will cover a wide range of topics that are aimed at inspiring and encouraging organisations to look at IT more strategically.